Approved and recommended by Quick Find Directories, Avondale Roofing Services have over 20 years of experience and are a specialist in roofing and roofing repairs. Their roofing covers all types and sizes of projects from small roof repairs to installations of brand new roofs. A local trusted roofer in Birmingham, Olton, Shirely, Solihull and surrounding areas. "We used Avondale Roofing for our flat roof problem, they were great, would have no hesitation in using them again or recommending them to others." "Our guttering,fascias and soffits were old and looking jaded,the guttering by the gable end had dropped a little and when it rained we had a constant drip.We got in contact with Avondale Roofing and decided to go for a complete replacement.Edward and David have done a great job I would recommend them to any one and it has really lifted the look of the property." "Quick visit after called out when we found leak in ceiling, and quick visit to carry out work after quote. Very friendly, helpful and would highly recommend Avondale Roofing Services to anyone. We are very grateful to Edward and David for all their help and assistance. Many Thanks." "Hello Tony, Maureen and Pete! Thank you very much for the positive recommendation for Avondale and for visiting the Quick Find website, we are glad to hear the team have sorted your leak out!" "Very happy with their work. Ed and David were very professional, polite and honest in their dealings with me. Their pricing was very reasonable. They left leaving everything tidy. 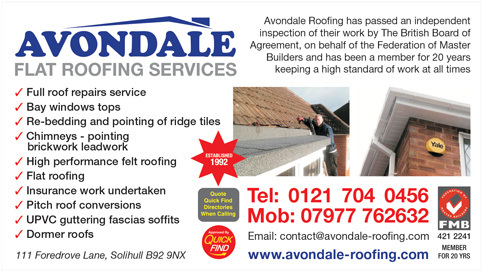 I would recommend Avondale Roofing Services." "Excellent job, done to time and with an equally excellent price. The job was left clean and tidy. I have no hesitation in recommending Avandale and will be using them for future work." "Very good company, came out to fix my leaking garage - very efficient and professional. Left everything tidy and very cost effective." "I used this company as I had seen them previously working on a house down the road. I found that they were very approachable, as well as giving me the relevant information about their service. They also told me that they would come out to my house for a no obligation quote. I found that they were also very honest about a job that did not need to be done when I had previously been told that it would have to be done professionally. Their pricing is fair and they work to a high professional standard; very impressed with the service and I would highly recommend." "They carried out some roofing repairs for us over a 2 day period a week ago and were absolutely excellent. They provided us with a reasonable and realistic quote (ie only for the work that was actually required - unlike others). On the days of work they were extremely punctual, arrived on days they said they would, kept us informed at all times of work and progress and had a wonderful attitude in their approach to work. The job was carried out exactly as agreed and to an excellent standard. We would highly recommend this company to anyone in the future."